Greetings Everybody, I am Elrah of Rhythmic Service. I wanted to join in for a moment because I am also having a birthday. Actually I have a birthday every month, but I have not told anyone about it because you do not quite have enough numbers to add up to my birthday. No, we are past the 200,000 mark now and we just kind of forget about it from that point. I wanted to celebrate with all of you though, because you understand what is taking place on Planet Earth and it is becoming rather beautiful. Now we know you have all these problems that are a concern: ISIS, Al Qaeda, plus all these different things going on in your world that you think you have to control, Dear ones, I will tell you something else. There are so many different divisions of this for you live in one aspect of it only. There are other choices being made and some of the most beautiful parts about this are occurring in another dimension of time and space right next to yours. In the dimension closest to you, if you want to think about it that way, they have just resolved the situation. There they have found a peace, discovering a way to neutralize the hate and the war on planet Earth. It might even spread to others, so hold a little bit of hope. Why? Because the vibrational walls are becoming mighty thin now and you are going to see a little bleed through from that. All of a sudden you will be walking around thinking, “Oh, the world is a mess! I do not have anything to be happy about.” Then all of a sudden you will find yourself laughing. Well, that is a re-set and what we get to do from this side of the veil. You still have free choice. We do not impose anything on you, but we set up an opportunity for you to see the hope because that is the part that is missing. You understand that when you are looking so closely and holding on so tightly, that you actually project what you want to see on the screen in front of you. Yes, dear ones, you create your own reality this way day after day after day. When you do not see your heart’s desire reflected in other people and they do not seem to be going in the same direction that you are, now you will see a little bit of a change. It is that difference that can cause you doubt yourself and wonder what is taking place in the world around you. Well, dear ones, you are all connected in these beautiful ways. Let us just share with you that that connection is growing stronger. As you start unveiling the parts of each other, you will see the ways you are connected. It allows you to see that little shift of your own heart energy, which can make a difference with the people around you. It can even spread out into your communities, cities, countries and every part of the globe, for it is magical energy indeed. We want to reassure you that you are never alone. Never, ever alone! Oh, you have all these challenges going on and you are trying to figure out the world. That is what you want to do. You want to explain it all on a piece of paper and say, “This is how it works. This is what is going to happen.” It does not always work that way, but you have come pretty close. Now you are reaching a point where you can rediscover your own power and that is beautiful! You have all new rhythms on planet Earth and many of you are trying to adjust to them, but we know that many times you have challenges. Re-member, dear ones, that you have strength built in; you have a part of us within each one of you. We want to share with you that over the next several months, there will be opportunities to release your worries and challenges that you experience, always trying to fix the world. You can start letting go of some of those things and enjoy the journey for a little bit. Now we tell you that yes, you are part of the world.Yes, these are everybody’s problems that they have to resolve and communicate with, and you may have a part of that. For now we will wait and see, but in the meantime you have the ability to ground a tremendous amount of light. That light is in need of being grounded right away, because there is more of a vacancy of light in the Earth than you can imagine. Dear ones, you can be the vessels to bring it through. So what we are going to ask you to do, even as you have all these challenges happening on your planet, is this take a moment out of the games…all of them. Do not judge them as right or wrong, just put them on pause for a moment and work with your light. Bring your light through to planet Earth. Start bringing some of the energy through and for 30 days. Every time you look at something and your mind says, “Oh, my goodness, what is going on?” just stop. Stop whatever you are doing in that instant, take a breath, bring the energy through you and just ground it. It feels wonderful in a physical body when you do that. That is the idea, yes, you have it now! We will tell you first of all, there are some really good people on the job. A lot of Lightworkers are working at this already and we will ask you to send energy to settling the Earth collectively, but do not take it on as your responsibility. That is the important part, because once you take it as your responsibility to fix the world then you go down with it, and we need you. We need you full of energy, full of life, and full of rhythms. We are ready to set the new energies of planet Earth, so take this and make something magical of it. These are the times that all of you wanted to be here. You actually rearranged your whole cosmic schedule so you could be on Earth at this very moment. That was beautiful and we are really proud of you for being here during these times. Trust that you are making a major difference. Watch for a couple of things. Number 1: When you are watching your televisions or reading news stories online or in the paper, you often say, “Oh, this is really sad. This is really difficult…” Take a moment, set it down, shut off the television or whatever you need to do and run some energy to that beautiful planet that you are on. She can really use it right now and furthermore, she will provide the essence to help resolve the problem anyway. So, it is all coming in a beautiful path. Yes, you have a few more difficult turns to take. It is no surprise to tell you that you have a few unruly people on planet Earth and they are scared. That is really what this is all about. Now there are a lot of predictions we can make about it, but let us stay removed from it all for just a moment. Let us refresh your hearts and reset a new energy of hope. That is where it comes from and if you cannot find it in your own world, then all you have to do is pay attention to the adjacent reality right next to yours. Sometimes you will find yourself smiling for no reason, but that is a perfect reason right there. We are sending it to you to tickle your funny bone, to remind you that it is a game and you are supposed to be having some fun. Now you have it. That is what we are going to ask you to do: ground your light into the Earth. She needs the light; she can use your balance in a lot of ways. That will also put your energy to work in a grounding process that is perfect, because each one of you have a little part of the puzzle that is going to be needed to build this new Earth. You all have little unique parts that are beautiful but they all have to come together, which means that you have to have enough communication to do that. Well, that is going to be happening. Now that you have the impetus to do that, do you realize what has happened? Can you see that perhaps this may be the first time that you have all these countries talking to each other? It could be magical. You could walk out of this with a beautiful escalation of vibration. You can walk out of this to live in a whole new place, so expect that. Set that in your path ahead as a crystal. Then when you walk upon it, you say, “Oh look at that. It all happened just the way we wanted it to. What do you know about that? Maybe I am a creator after all,” you will say. Yes, you are more than you can even imagine. The reality is you have done pretty well even though when you first got here, you did not want to do any of that Yes, yes, a lot of you had to panic, and many experienced separation anxiety from being away from home and being alone as a spirit. At least you think you are alone because that is the game you are playing…pretending to be separate. We ask you to connect to the Earth especially during the next 30 days. It will make a lot of difference and send a graceful energy all over the planet. That is your responsibility and it is what you came to do. Many of you came with very unique gifts that you brought here to Plan B. Plan A is over with and it did not end the Earth, so you have made it to Plan B. Now we are excited to see what you can build and do with this place. You have a beautiful garden planet in the universe, so what are you going to make of it — what is next? That is the question we are going to ask you now. You can wait for feedback and see what is happening with the world as things unfold. It is time for the conscious creators to awaken from the dream and enjoy the journey, for it never was about the destination. You do not have to arrive anywhere. Just stay in motion because it is about the journey, which is the whole purpose. So swing way over here, then take a little detour over there. Along the way do not forget to go down here and way up here, then experiment all over the place. Enjoy every part of it, because all of it is for your pleasure; all of it is for you. You are the magicians that set this into motion. We are simply here to help you re-member who you are and help you pick up the pieces from there. You had a lot of dreams before you came here to planet Earth, both individually and as a collective. You came in as part of a really large group, the Family of E. You have already made huge impressions and pushed the Earth, as well as humanity, in a direction of growth and sustained evolution. Magical. Now you get to do it again, but this time open your eyes during the process. Become aware that you are not alone; you are actually holding hands with a group of beautiful people around you. Dare to look them in the eye and offer encouragement. Open those paths ,and you will start to move as a collective of humanity, instead of a group of individuals all scampering around trying to find their own way. Now is the time and you have the motivation to do so. Your leaders are also coming together for a common cause. No matter how difficult you think that common cause is or the challenges on Earth, focus on the positive. Take a look at some of the things that would not have happened had this not been in motion. You are on a beautiful path and you are truly in charge of it, so enjoy the journey. Take it wherever you like it and enjoy the areas of discovery of all kinds of planet Earth. Know above all else, that you are loved more than you can understand. We watch you every day, dear ones. We see some of the struggles you go through, and we watch you taking responsibility for things. We know when your heart is hurting and we see that sometimes you cannot get your energy out. It is all turning around and you have that part of it deep within you. So, become part of the collective and speak your words. Let it out and do not worry about the effect it has, simply speak it from the heart. Share it in such a way that there is room for other people to have their own truth, too. Although you do not have the only truth, it is also important that you start speaking your truth because you carry that precious little part with you. You may doubt your power and you say, “Who am I? Who am I going to be? Am I the one who saves the world with my little piece that I brought from Home?” Well, you cannot unless you put it down now, can you? That is what we are asking you to do. Put your piece in place. It is time. Above all, enjoy the journey. It is with the greatest of honor that we greet you in these ways as the collective of what you call the group. That is not a word that we put on it, but we do find it very amusing. And we also find it very beautiful. What is happening here is you have resonated a part of your heart that reminds you of Home and why you are here. So keep up the great work and know that you are loved. There is a brand new rhythm on Earth and you are pretty close to adapting it into your lifetimes. Watch for the hope, dear ones, no matter where it comes from. Accept it. Make a space in your heart for it to come into your reality, and then ground it when it does. You are on a beautiful path. Know that we are right behind you every step of the way. It is with the greatest of honor that we ask you to treat each other with respect. Nurture one another every chance you get and open the door for each other for heaven’s sake, because it helps a lot. And play well together. It is with holiday cheer that we send greetings from our hearts to yours at this special time of the year. It is our hope that the spirit in the air in this magical season finds you full of joy and hope. Together we can spread peace and light onto this planet one heart at a time. Let it begin with us. 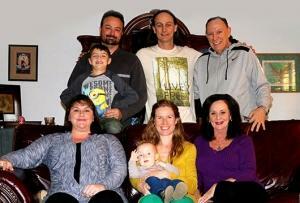 Our family is blessed as it grows to include our two sons, wonderful daughter-in-laws and our two grandsons. On top of that, our Belgian “daughter” Elke, has also blessed us with a granddaughter recently. Our extended biological family continues to spread out and grow every year as the children we saw grow up now are having their own families. The same is true of our spiritual family of Light. We see it growing each year as we connect our hearts. Thank you all for being such an important part of our lives. During this season we take a moment and honor you as family.